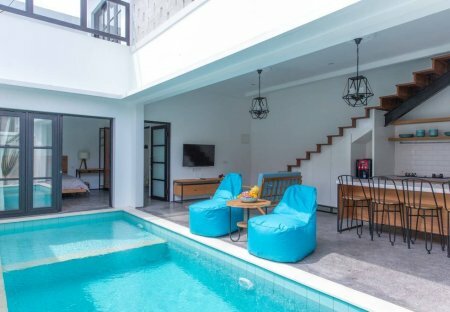 Rent villas in Canggu, Bali with private pools. Book affordable holiday rentals that are near a beach. Villa Sound of the Sea belongs to some of the best beachfront properties within Bali. Stroll through the jungle and around the Paddy fields in order to discover a small Balinese community on the beachfront. Here you'll find Villa Luxe Mary - a spectacular ten-person luxury villa. 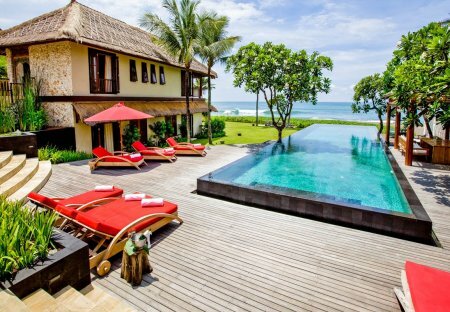 Villa Waringin is revered as one of the very best beach front properties in Bali. Kalani Residence consists of two fabulous villas which can be rented separately, with their separate entrances, or as one huge nine-bedroom delight. This property is located 2,7km to Pererenan Beach (about 5-8 minutes by motorbike with 30-50km/hrs). You can find local and westerner restaurants along the way jalan pantai Pererenan..
Villa Meiko is a stunning bright, light and spacious airy home - infused with natural materials and chic designer touches. Offering four wonderful bedrooms. Villa Kala is a resort style complex composed of four pavilions, in the traditional Balinese style of separate but interlinked living spaces. This masterpiece of Balinese architecture and design, perfectly portraying its rich culture and history, is something of an icon in the area. And rightfully so. Indulge in luxury living at this modern home away from home. Set among the rice fields in Canggu, this villa boasts a minimalist sanctuary. In the heart of Canggu lives this exceptional warehouse that is actually an artistic, eco-friendly home away from home, perfect for those seeking a unique and unforgettable place to stay. Sipping on fresh coconuts, a local fruit platter on hand and a private pool calling your name during the heat of the day, what more could you want on holiday? Maybe. Escaping to Bali is a dream of many; a getaway that is filled with the sound of waves crashing on the shore and the scent of coconuts, sea-salt and tropical flowers. The Frangipani Retreat is a private, exclusive and utterly enchanting Villa-Resort that is only minutes away from some of the most notorious surf breaks on the South West coast of Bali. Villa Ananda offers an unparalleled architectural and design experience! Stunning, majestic and achingly cool - it is a masterpiece in contemporary and bold modern design. Close your eyes, imagine the sound of waves crashing on the shoreline, the scent of frangipani and salt water in the air. In front of you is the ocean for as far as the eye can see.